As an Immortal, it is Jonathan Murphy’s responsibility to ensure the safety of the sylph and humans; to protect them from other Fae, such as the vampires and shapeshifters. His closest companions (also Immortals), Thomas and Kathryn, are always by his side as they work together to police these dangerous Fae. ‘Enchanted Immortals 2: The Vortex’ focuses on Jonathan Murphy’s character; the man he once was to the Immortal he is now. As a human he was living a humble family life as a carpenter and his story is full of love, romance, wonder, action and heartache. He is a strong man, making plans for his future. However, that future was not to be. Well, at least not the way he thought it would be. From early on in the novel there are very exciting action scenes which open up the readers’ eyes. These action scenes, and those throughout the novel, are very dark, dramatic, quick-paced, detailed and intense. At the same time they are violent and gorey in parts. We can imagine how dangerous the vampires and shapeshifters are, at the same time as being completely shocked at their very existence. This enables the reader to empathise with Jonathan’s character from the beginnning as he becomes involved with events that are otherwise unbelievable. Whilst certain shapeshifters are being searched for by Jonathan and his friends, the vampires are planning their next venture. And it was reading this scene that my heart began to race, as one vampire asks about what they are to do next and the reply is, “We’re going back to the Oregon Vortex”. The reader stops in their tracks at this point, knowing that there is a great deal of trouble to come. There are so many areas of the ‘Enchanted Immortals’ series that I love, one of them being the flashbacks. In this novel, we follow the journey of Jonathan in the present day, we are taken back to the early 1800’s when he is human and in-between we find out more about Kathryn and Thomas’ relationship with him. The reader also has an insight into what happened when Thomas became an Immortal and Thomas’ relationship with Malina, a sylph Queen. I, personally, find the sylphs adorable. They all seem very beautiful and feminine. They are caring and loving towards the Immortals, humans and each other. However, they still have to be realistic when bearing the vampires and shapeshifters in mind. Therefore, at times when protecting their allies and friends they have no choice but to harm their enemy. It was the sylph’s that began the existence of the Immortals with a potion they call ‘Enchantment’. This potion allows the Immortals to be very strong and each Immortal to have their own ability. 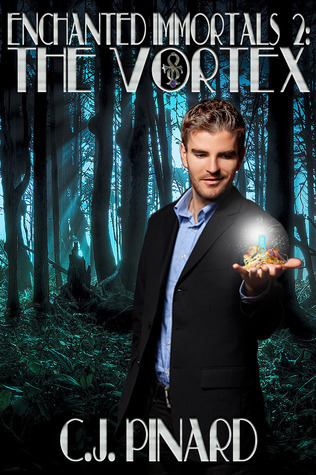 In ‘The Vortex’ the reader discovers the history and origin of this magical potion. The whole novel has a great storyline, with really likeable characters, action and adventure. ‘Enchanted Immortals 2: The Vortex’ has simply everything that you would want to read in a fantasy/paranormal novel. As mentioned in my review of C.J. Pinard’s debut novel, ‘Enchanted Immortals’, the style of writing is somewhere in-between that of Laurell K. Hamilton (Meredith Gentry series) and J.R. Ward (Fallen Angels), leaning more towards the J.R. Ward style. I am looking forward to reading the next instalment. If you would like to contact C.J. Pinard you can reach her on Facebook at http://www.facebook.com/CJPinardAuthor or you can e-mail her at cjpinardauthor@gmail.com. 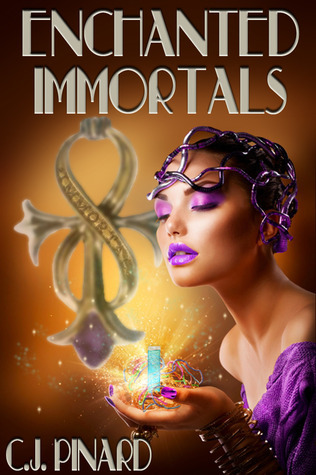 ‘Enchanted Immortals’ is C.J. Pinard’s debut novel. This is a great book that put me in the mind-set of authors like J.R. Ward and Laurell K. Hamilton. As well as being a fantasy/paranormal it is also a good cop thriller. The novel is full of action, adventure, emotion, great characters and great storyline. There are many characters and different groups of people. Each of them adding their own layer to the story. There are the Immortals, the sylphs, humans, vampires and shapeshifters. For a debut novel this is a splendid introduction to many of the characters, enabling the reader to connect instantly and thus, making it easier to follow them should there be more books in the series. The main focus of the story is on Thomas O’Malley. Thomas O’Malley endured a life-changing ordeal and ultimately became an Immortal. It is an Immortal’s job to protect the sylph and humans from vampires and shapeshifters. To remain an Immortal they need doses of ‘Enchantment’ provided by the sylph. The vampires want to steal the ‘Enchantment in the hope that it will allow them to daywalk. But will they succeed in obtaining it? If they do, will it work? Thomas works with Jonathan and Kathryn and at times they find themselves in some predicaments with the vampires and shapeshifters. One of my favourite elements of the story are the flashbacks throughout the separate era’s. The reader is taken on a journey through Thomas’ past and how his disappearance affected his parents. Joseph O’Malley, Thomas’ dad, is one of my favourite characters. His story is heartbreaking, sorrowful but completely full of unconditional love. He works as a cop for the San Francisco Police Department and tries to do everything within his power to try and find out what happened to Thomas. As Thomas is an Immortal he is not supposed to be known to man, and therefore Thomas must not contact his father in any way. This is beautifully written and I was very touched by these characters and this particular storyline. The magic element of ‘Enchanted Immortals’ along with the ‘Enchantment’ and the fae people holds a similar imagery in my mind as that in the ‘Meredith Gentry’ novels by Laurell K. Hamilton. However, this novel has more realism, with the San Francisco Police Department, the Bureau of Supernatural Investigations (BSI) and Thomas’ parents and past. The combination of the two, fantasy and realism, remind me of J.R. Ward’s ‘Fallen Angel’ series. In ‘Enchanted Immortals’ the government have set up a new body, the Bureau of Supernatural Investigations (BSI), to investigate the strange happenings of missing people, mutilated bodies, anything that seems to have no explanation. This set up brought back memories of watching ‘The X-Files’, although instead of ‘Dana Scully’ and ‘Fox Mulder’, C.J. Pinard has Agent Adam Swift and Agent Anthony Bianchi. These are another pair of my favourite characters. I love the thriller side of this novel, the investigations, the mysteries that these agents need to try and unfold. There is also some romance in parts but I am sure this will become more intense during the follow-up novels. I was excited to hear that there would be a follow-up as the reader is left needing to know so much more even though this book is wrapped up beautifully. Thank you C.J. Pinard!